What type of fence will contain my dog? You are here: Home / Fence School / What type of fence will contain my dog? I know how much you love that “pooch,” and you know him better than anyone else. 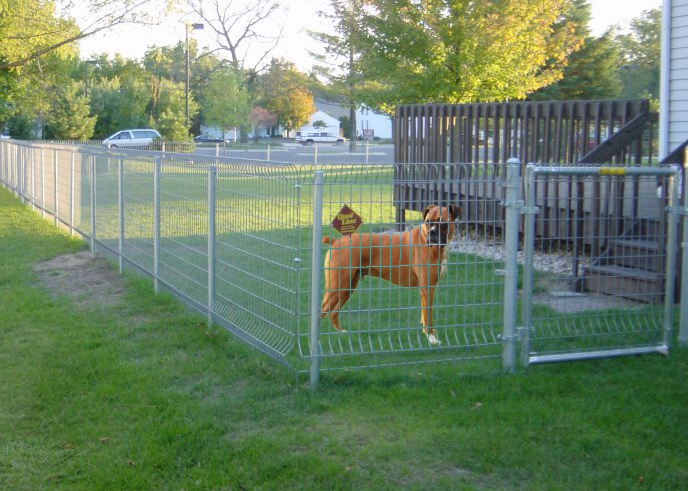 So let’s talk about the things that will help keep him safe in your newly fenced yard. • Is yours a large dog who might jump over the fence? Then consider a 5’ rather than 4’ high fence. Maybe even 6’ high! • A very small dog might wriggle between the uprights of a normal picket fence. All of our fences are custom built on your property. We put up wood picket fences piece by piece, so you can choose as wide or narrow a space between the pickets as you wish. The pickets on ornamental metal fences are normally spaced 4” apart. But you could possibly order what’s called a “puppy fence,” constructed with additional shorter pickets to keep those little dogs from harm. • Maybe your property isn’t level. That might mean your dog could escape. Using longer pickets can close the gaps. And we make sure to follow the grade where there is a slope. As we design your new fence with you, please let us know what questions or concerns you may have. A fenced dog is a happy dog!